If you know me, you know I can’t say no to oysters. And in this case, neither should you. 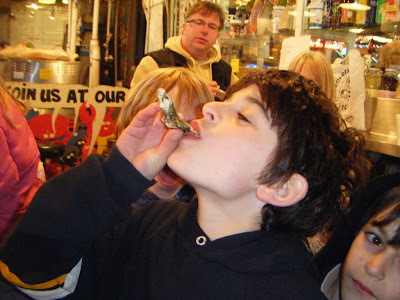 The Puget Soundkeeper Alliance is holding their Second Annual Community Oyster Roast on Sunday, April 26 at Golden Gardens Bathhouse, which, if you haven’t been, is one fun waterfront event space. In fact, the Soundkeepers are holding two benefit roasts: one from 2 to 4 p.m. and another from 5 to 7 p.m. Your donation ($50 a head, kids 6 and under free) buys a ticket to plenty of eats (in addition to the coal-roasted oysters), drinks and live entertainment from those bluegrass virtuosos the Tall Boys. Advance tickets are available through the Puget Soundkeeper Alliance (contact info here) or via Brown Paper Tickets. See, even kids like ’em!